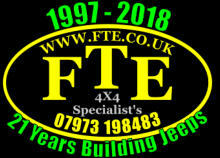 Welcome to FTE 4x4 Specialists with 21 years experience of building custom Jeeps. 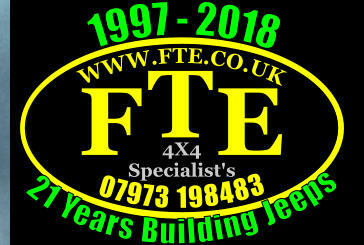 "From Mild to Wild"
Welcome to FTE 4x4 Specialists Custom building Jeeps since 1997, as the board outside the shop says “Mild to Wild”. If you would like a Jeep unique to you then give us a call or drop us an email. 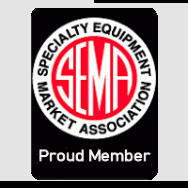 We are a small company that takes every build very personal. We do not have any pre priced packages because every Jeep we build is unique and personnel to your individual requirements. In 21 years we have not built two identical Jeeps, every Jeep is personal to the owner. Having a Jeep built by FTE 4x4 Specialists is unique to you! We can either modify the Jeep you have or we can source the Jeep to start with. As the shop sign says from "Mild to Wild" covering suspension, drive-line, axles, brake upgrades, engine changes or modification, bodywork, bumpers, rock rails, skid plates, winches & mounts, interior, lighting, wheels and tyres. We can supply it all from start to finish, we are the UK importers for Teraflex, Rugged Ridge, Rock Krawler, JCR, Rare Parts and Rubicon Express to name a few. We also have access to basically any parts available in the US.